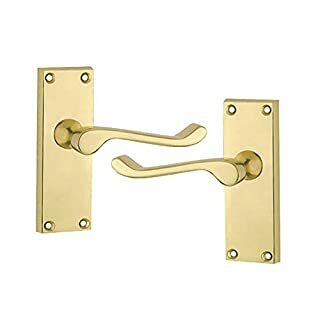 5 sets of door handles, high quality finish to add a perfect finishing touch to your interior doors. Backplate size is 120mm x 42mm approx. Comes with all screws and a spindle. Supplied with bar and fixing screws. Short backplate, dimensions: 118 x 41mm. 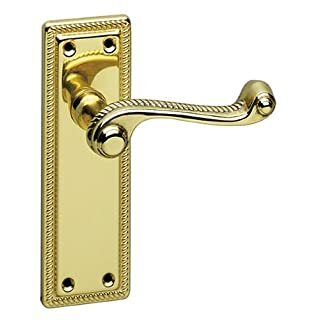 Victorian Scroll Door Handle Lever On Backplate Privacy Set Are Used On Bathroom And Toilet Doors. They Come With An Emergency Turn On The Outside Should You Need To Gain Access. 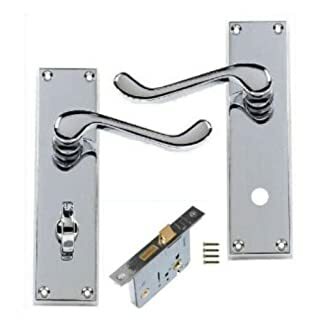 You Don'T Need A Specialized Bathroom Lock As The Handles Have The Lock Built Into Them. Supplied with bar and fixing screws. Backplate dimensions: 150 x 48mm. 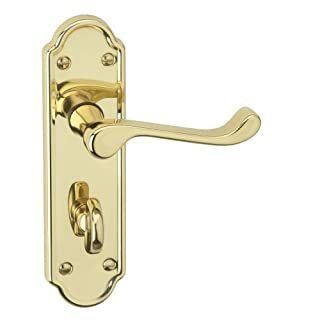 Urfic Ashworth Latch, Door Handles on Backplate FeaturesWood screw fixingEuro profile availableMaximum door thickness: 45mm - 50mm with spindle supplied18 microns lacquer over brassAll furniture suitable for internal and external use and carry a 25 year guaranteeSold in pairs with spindle and fixing screwsTubular lataches to be purchased separately Dimensions 170 x 45mmHandle Projection 50mmLever Length 98mmProjection N/A Pack Qty 1 pair*Note: Product image is there to represent the style and in some cases such as Lock Plate or Bathroom Plate for example, the product will differ from the image, however will remain in the same style. 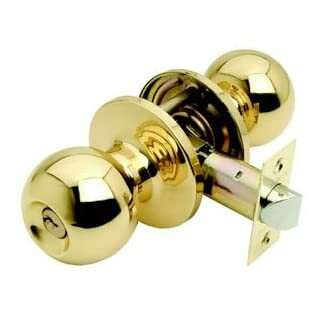 Urfic Ashworth Lock, Door Handles on Backplate FeaturesWood screw fixingEuro profile availableMaximum door thickness: 45mm - 50mm with spindle supplied18 microns lacquer over brassAll furniture suitable for internal and external use and carry a 25 year guaranteeSold in pairs with spindle and fixing screwsStandard mortice lock to be purchased separately Dimensions 170 x 45mmHandle Projection 50mmLever Length 98mmProjection N/A Pack Qty 1 pair*Note: Product image is there to represent the style and in some cases such as Lock Plate or Bathroom Plate for example, the product will differ from the image, however will remain in the same style. Urfic Ashworth Bathroom, Door Handles on Backplate FeaturesWood screw fixingEuro profile availableMaximum door thickness: 45mm - 50mm with spindle supplied18 microns lacquer over brassAll furniture suitable for internal and external use and carry a 25 year guaranteeSold in pairs with spindle and fixing screwsA bathroom mortice lock is also required Dimensions 170 x 45mmHandle Projection 50mmLever Length 98mmProjection N/A Pack Qty 1 pair*Note: Product image is there to represent the style and in some cases such as Lock Plate or Bathroom Plate for example, the product will differ from the image, however will remain in the same style. 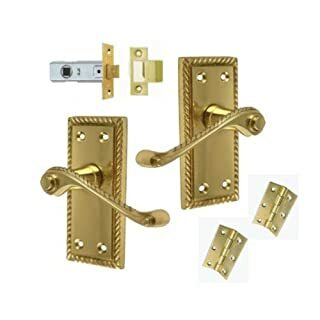 5 Sets Polished Brass Finish Victorian Scroll Door Handles Internal Set Comes with 3" Hinges and 64mm Tubular Latch- High Quality - 118mm x 42mm Approx. Supplied with bar and fixing screws. Backplate dimensions: 150 x 40mm. 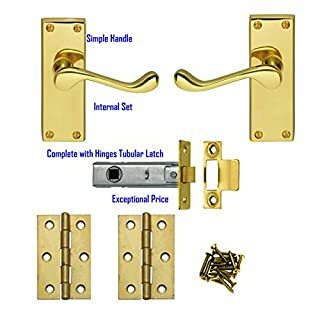 Bathroom lock 118 x 40mm. Supplied with bar and fixing screws. Backplate dimensions: 150mm x 40mm. 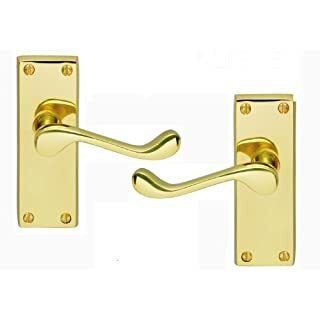 These handles come complete with a Bathroom Lock. 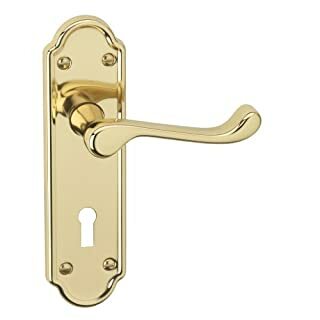 Carlisle Brass Victorian Scroll Lever Latch Door Handles Polished Brass The superior quality door handles are designed for use with a tubular mortice latch (not Supplied) and come complete with a Carlisle Brass 10 year mechanical guarantee. 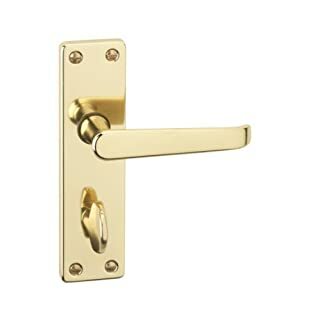 The Carlisle Brass polished brass door handles are lacquered making them virtually maintenance free. They should be cleaned with a cloth moistened with soapy water or alternatively wiped over with a soft cloth with beeswax. 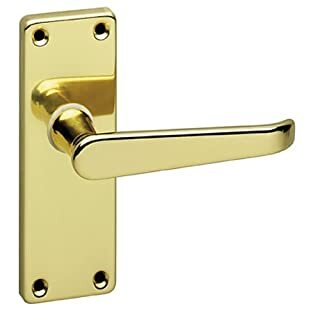 All our door handles are brand new, boxed and in stock for immediate delivery. 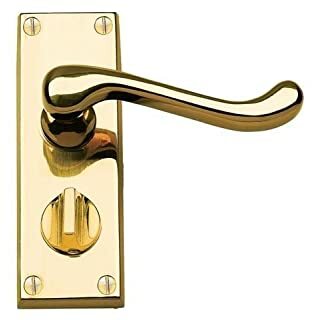 VAT Invoice Supplied We supply 64mm and 74mm Latch sets to accompany these handles as well as bathroom handles, lever lock handles and mortice locks. 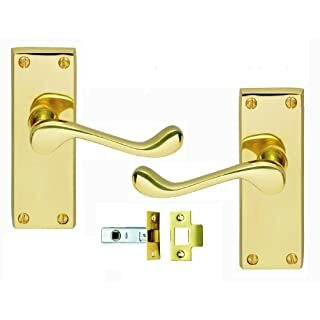 Package prices available for any combination of door handles, latch and lock sets, cheaper than buying individually. Please email us with your requirements and we will give you a competitive quote. Any queries please email or call us on 01905 780189 Specifications Backplate: 120mm x 40mm. 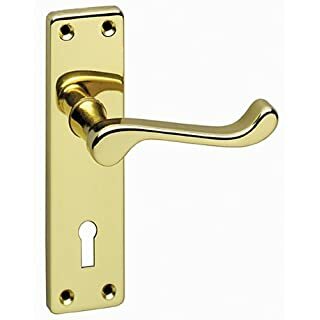 Lever Length: 98mm. Projection: 55mm. Complete with fixing screws and 8mm Spindle. Supplied with bar and fixing screws. Backplate dimensions: 150 x 40mm. 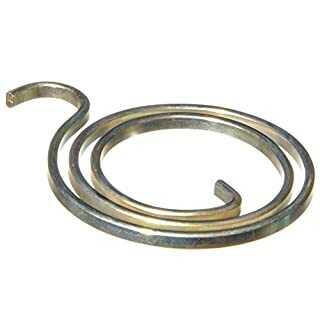 Door Handle Springs (2.5-turn coil, 2.0mm thick) for internal door handles. This spring has an external diameter of 27.5mm. A spring with an external diameter of 30mm is also available (see separate listing). 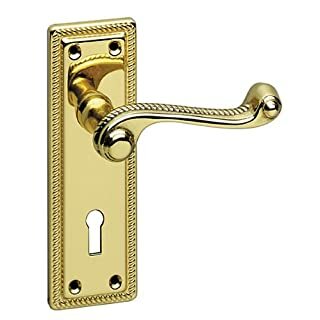 Can be used on both right handed and left handed handles. Spring dimensions are shown in the additional photograph. The springs have a passivated zinc coating for corrosion resistance. 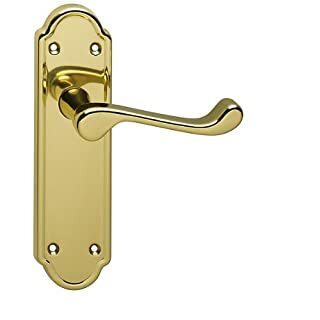 When replacing a door handle spring the two most important things to check are a) the orientation of the external hook compared to the internal hook eg. is it a 2-turn coil or a 2.5-turn coil and b) the thickness of the spring (we define thickness as the height of the spring when laid flat). Most springs are retained with a circlip, which can be removed and replaced using external circlip pliers. External circlip pliers are available quite cheaply elsewhere on Amazon. This spring is 2.0mm thick. Please note that if you fit a thinner spring than originally fitted the handle will have some excess play. If you fit a thicker spring than originally fitted it may be difficult to replace the circlip and the handle may have a tendency to stick. 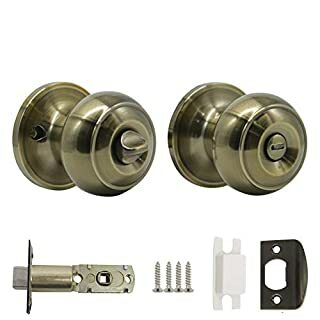 To see the different types of door handle spring we sell please click the 'sold by Northern DIY' link above and then on the following page click the link for 'Northern DIY Storefront'. Tip: When fitting a new spring a little grease will give better wear and movement. Fitting instructions are available on the Northern DIY website.